Learn what’s new in Ubuntu Core - the secure, lightweight and robust operating system for the internet of things. Canonical and partners speed up your device development. Security is our job from the moment you power it on. We redesigned the entire system from first boot to create the most secure embedded Linux for devices and connected things. Every aspect of the system is checked and verified. You need to know your software is pristine; not just for installation, but for the whole lifetime of the device. Immutable packages and persistent digital signatures mean Ubuntu Core can verify any software component at any time. You trust your developers, but anybody can make a mistake. We created a whole new armoury of Linux security capabilities to ensure all applications stay confined to their own data. Core is for machines, so we stripped it down to bare essentials. Fewer packages to attack, fewer bugs to fix, fewer forced changes. We reduced the OS to reduce the attack surface. That leaves more disk for your IoT applications and data. We check every snap for known weaknesses or risks. Ubuntu Core benefits from the automatic scanning of all snaps for vulnerable libraries and problematic code. Bring your applications, we take care of the rest. Decide which updates go to your devices. As a device manufacturer or a snap publisher, you decide which updates are signed, certified and delivered to your devices. Your own app store. Your own software portfolio. Every device built with Ubuntu Core has a secure app store. Use the global store for access to all the standard apps, or curate your own collection. Absolute control over every device in the building. Enterprises gain complete audit and control over every piece of software on every single device on the network. Regardless of manufacturer. Know exactly which kernel version and which OS version is running. You decide when updates happen. You decide which versions, too. We help you keep track of the licenses you depend on. Standard license metadata simplifies compliance. Ubuntu Core uses open source packages from the world’s most widely deployed Linux, and we track licenses in all key components. Thousands of applications built to work across devices. A standard platform helps publishers support multiple devices without recompiling. And everybody wants to support Ubuntu - it’s the most widely deployed Linux in the world. Every Ubuntu Core device qualifies for Canonical support. Your Ubuntu Advantage contract covers enterprise support for all these devices. Get to the heart of a problem faster, get fixes straight from the source. Your business is software defined. Keep developers happy and productive to attract the best talent. Bring your apps from Ubuntu Server to Ubuntu Core. 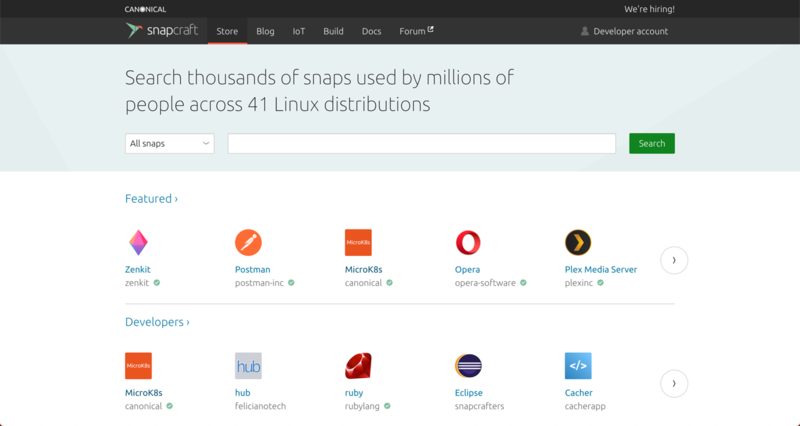 Snaps run on Ubuntu Server, Desktop and Core. One platform, one process. Your developer workstation, your build farm, your cloud and servers all use snaps. Your appliances too - with extra security. We handle the board. You handle the apps. No bad BSPs. No maintenance nightmares. No integration delays. Just develop on Ubuntu. Embedded, but not as you knew it. Publish direct to devices and watch updates in real time. Bring continuous deployment right to the edge. Put your devices on rails for rapid iteration with continuous deployment pipelines, beta testing and canary updates. Featuring Travis integration and a multi-architecture build service. From Github to Ubuntu Core in minutes. Ride the open source wave, or build your own community. Open source projects default to Ubuntu, so building is easy. Every application update has a backup plan. Every device has a backup kernel and OS. Bulletproof updates need a whole new approach. Preserve data and roll back on error. Automatically. Your power supply may not be reliable. Your devices will be. Resilience to adversity saves money and reputations. Bank on Ubuntu Core to deliver your updates safely. Low-level updates preserve the prior boot path. When you have to update the kernel or the operating system you want to know you can go back if needed. Ubuntu Core keeps the last working boot so you always have a safety net. Standard mechanisms for application data management. Every device has apps which keep track of critical data. We make sure you can manage the data which matters to you, consistently, across all your Ubuntu Core devices. Backup and restore anything, anywhere. Use Ubuntu Core for free. Pay only for extra services. The reference images of Ubuntu Core are free to redistribute. Engage Canonical for enablement and custom service levels. We’ll get you to market faster. Delta updates reduce traffic to the edge. Shipping and updating apps adds up to a lot of traffic. Control costs with automatic compression and delta composition. First class enablement for widely used boards and silicon gets you straight to market. Low-level development is a distraction in the race to market. Focus all your effort on the experience that differentiates. Pre-certified chipsets keep you out of the weeds. Finish your apps, then choose your chips. A standard platform means you can develop your software and polish your industrial design first, then choose the right size chips for your experience based on real code and data. Get the best deal when you’re ready to ship. Ubuntu runs the same. Your apps build the same. We support both 32-bit and 64-bit apps on both architectures. If it doesn’t compile and run the same, we’ll fix it. Open up your supply chain. Talk to us about using Ubuntu Core for your next project. Walk through all the steps to build an image for a device. Canonical partners with silicon companies, board manufacturers and ODMs to help you bring smart devices to market faster. Tell us about your project so we can bring the right team to the conversation. What sector(s) are you important to you? What device capabilities are important to you?